Good work! Proud to support you on Patreon! The game feels completely different now! Very dynamic. One thing I'd like to add is front touch screen control for precise aiming these long- distance shots maybe consider adding this when you're done with the openGL? You can actually use both touch and retrotouch to aim. For retrotouch, just enable the settings in Options menu. For touch, you'll have to make some changes in your config.cfg file in order to make it work as a set of buttons. 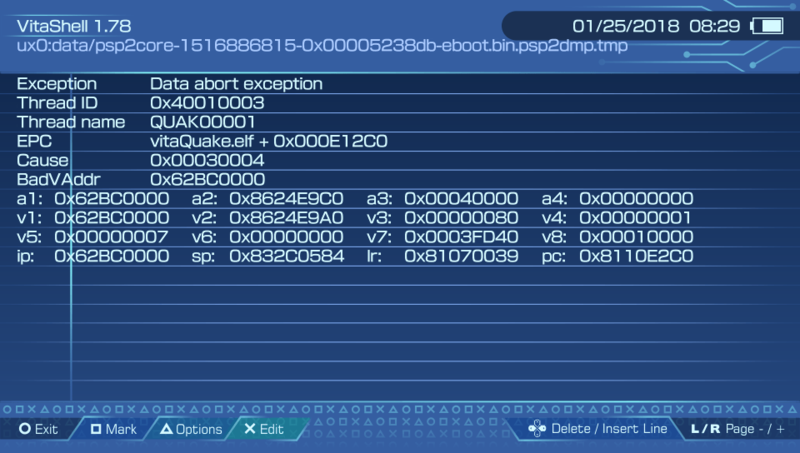 - Reduced VPK size by removing vita2d dependency. - Added animations interpolation: now animations are a lot more smoother (60fps vs the old 10fps animations). - Fixed underwater visual bug. Now lightmaps are disabled when underwater. - Moved mod manager in-game. Now can be accessed from Options menu. - Removed brown lines at left and right of statusbar, now statusbar will take way less screen space. - Fixed dynamic lights, now they work as intended. - MasterFeizz for ctrQuake source which i studied to understand how winQuake works. - Ch0wW for several improvements and code cleanup. - frangarcj, xerpi and Davee for helping during the journey that lead to the creation of vitaGL. Tried to remove remaining data folder and savegame files from 2.5 to do a fresh install, no success. Crash with the last version too. Should be solved now, redownload it from VitaDB. Hmm, that solved partially solved the issue on my end, but the game still crashes if any folder other than "id1" is in the "ux0:/data/Quake/" directory. Having both rogue and hipnotic instantly crash the game, it doesn't even manage to get to the console. It's the same exact crash dump from beforehand. I think it's a problem only with default expansions (hipnotic and rogue). I do have tf mod and it works perfectly. Probably there's a bug in Com_Init call, have to look further into this. I also needed to delete hipnotic folder that was in my id1! Now it works like a charm. Impressive work!!! - When the ps vita running vitaQuake 2.6 goes in sleep mode or if going to Vita menu screen for a second, turning it back on crashes quake with error C2-12828-1. I haven't suspended my system with the game running, so I can't confirm that issue. I can, however, confirm that there is still an irregular bug with exiting from the main menu itself back to the livearea. Occasionally it will work just fine, but most of the time it gets a C2-12828-1 error. I managed to get Rogue and Hipnotic working by renaming the folders. Someone on Reddit commented about it and it seems to work on my end. One thing I did notice is that mods with their own soundtracks load, but load the standard game's soundtrack. Both Rogue and Hipnotic have their own music/cdtracks directories but I dunno if this is an issue with the mod selector or not. Thought I'd mention it either way!